I have so much to be thankful for! I enjoyed Thanksgiving with my family in Waynesboro, Virginia-lots of family, lots of joy, lots of confusion, and lots of food! 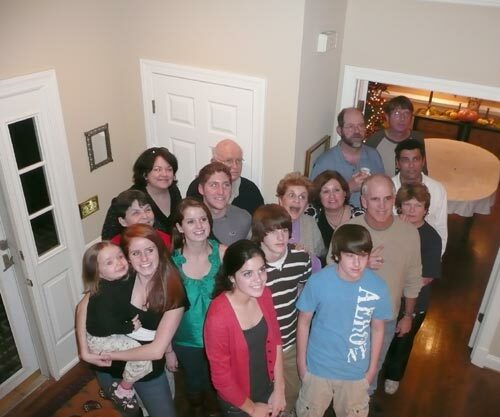 My daughter Mary Donnelly (beside the refrigerator) did all the cooking. 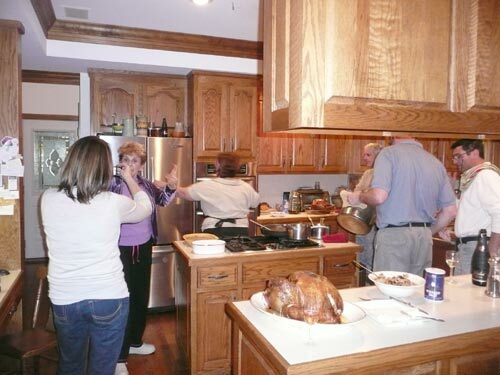 Every time too many people got in the kitchen, like in this picture, she said, "Out! Out! Out!" 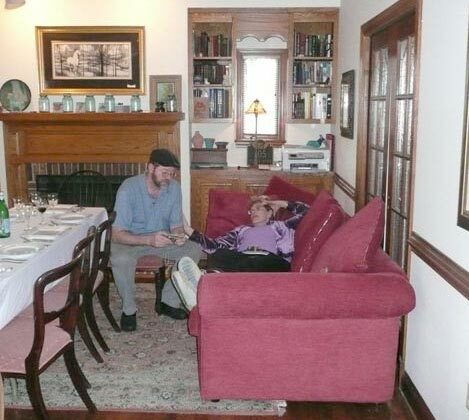 Since Mary banned us all from the kitchen, I propped my feet up; and, my son John and I had a quiet minute together. My daughter Patty and I set off Friday morning for Mechanicsburg, Pennsylvania, and my show with 2nd Floor Gallery. It was a delight to meet Nancy Tritt and her family. Nancy lives in Boiling Springs and sent me the reference pictures for the show print Boiling Springs Remembered. What a treat! Patty and I were invited to have dinner at the home of Mary Orse before the show Friday night. Mary has been collecting my art for years and is a good friend. 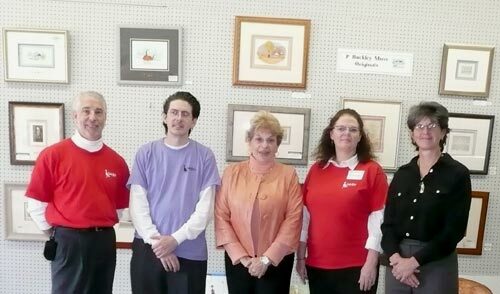 Martin's Gallery in Hanover, Pa., has been framing her things for many years, and that's where we met. 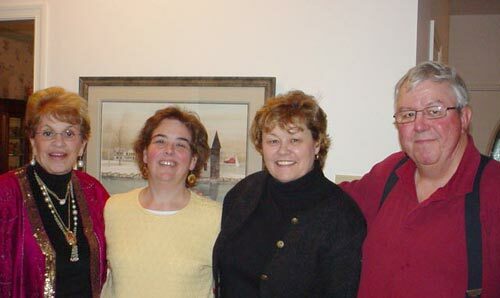 L. to R.: me, Mary Orse, Pat Martin (owner of Martin's Gallery), and Mary's friend Lynnwood Schultz. My friends at 2nd Floor Gallery, L. to R.: gallery owner Jeffrey Van Boskirk, Gallery Executive Director/Artist Terry Kennedy, me, Gallery Assistant Director/Artist Bronwyn Jean Hughes, and my daughter Patty. 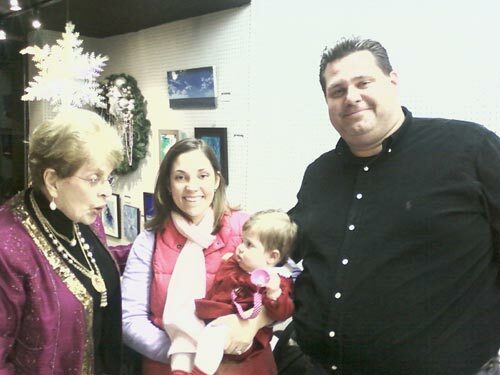 Chip and Amy Gerhart of York, Pa., brought their baby Charlotte Rose to see me. Charlotte Rose missed being born on my birthday by just two days! Chip serves on the Board of Directors of the P. Buckley Moss Foundation for Children's Education. What fun to see a smiling face from the past! When I was growing up on Staten Island, there was a Dr. Walsh and his family who lived two doors down from us. They were friends of our family, and we children played together. Many years ago, when I was returning from a show and driving through North Carolina one night, I became tired and tried to get a hotel room. There was a Furniture Market event going on in town, and all the hotels were booked. I remembered that Dr. Walsh had retired there, so I gave him a call and explained my predicament. He came out to the highway so I could follow him home, and I stayed with him and his wife. I gave them the print you see in the picture above, How Calm the Morn, as a thank-you gift. The couple in the picture with me and the print are Dr. Walsh's youngest son Kenneth and his wife. They brought the framed print to the show for me to sign on the glass, and we had such fun reminiscing about old times. 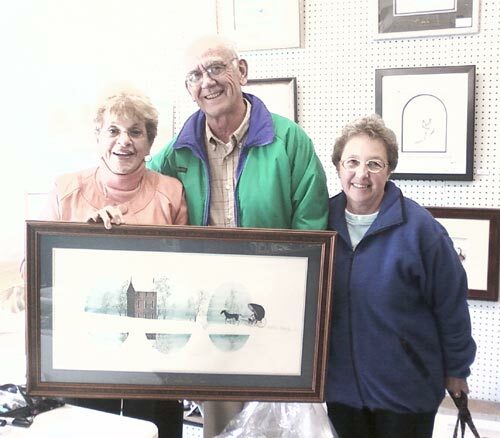 On Saturday the P. Buckley Moss Museum awarded its November Monthly Mystery Winner. Heath Moore, from Urbandale, Iowa, was the sixteenth visitor on November 28. He was visiting his in-laws in Afton, Virginia, for Thanksgiving and visited the Museum with six members of his family. He was the last one through the door and lucky number sixteen! Museum Receptionist Barbara Hodgen, left, and the November Monthly Mystery Winner Heath Moore, right. 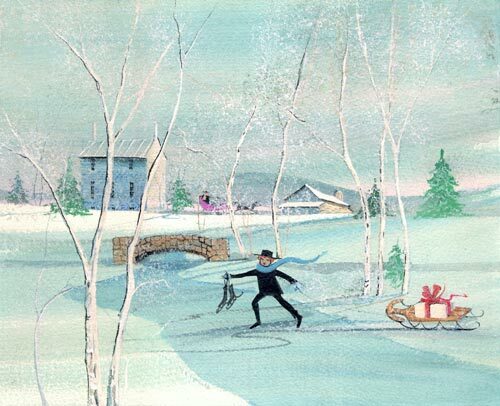 For more information on the Museum's Monthly Mystery Winner Program, please see my February 11, 2009, newsletter. Remember, the Museum is still working toward its 600,000th visitor, and that lucky person will receive a $500.00 gift certificate to the Museum's gift shop. You have through the rest of the year to maybe be that person! This weekend I'm going to attend an art show instead of being the shower! I'm very much looking forward to attending the Art Basel Miami Beach. I've heard about it for years but never had the time to go. It will be fun for me to see other people's work and meet old friends in the art field. On Tuesday, December 8, Patty and I will be in Kingsport, Tennessee, for my show with Up Against the Wall Gallery. Gallery owners Mike and Lisa Anne Milhorn and I will release my new print of the area Winter at the Inn, featuring the historic Netherland Inn. This is the first in what will be a four seasons series. 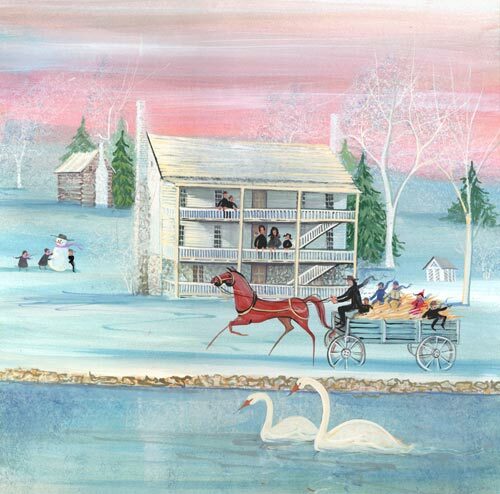 Winter at the Inn will be released as a giclée on paper during my show with Up Against the Wall Gallery in Kingsport, Tn., Tuesday, December 8. For more information, please contact the gallery at 423-246-7210. After my show with Up Against the Wall Gallery, I'll go to Waynesboro for my Museum Open House and Barn Show December 11-13. 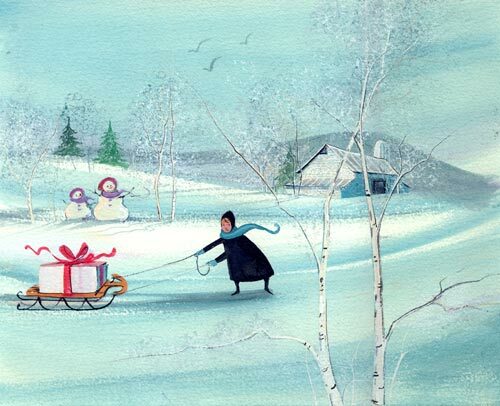 I can hardly wait to see the beautiful Christmas decorations at the Museum and The Barn as well as so many friends! My youngest daughter Ginny and her husband Corrado did all the trimming at The Barn this year. 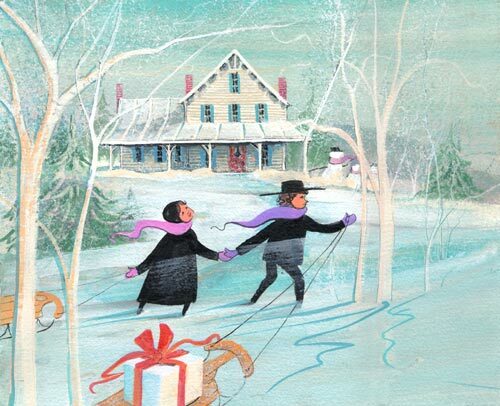 Over the River, Through the Woods, and To Grandma's House We Go will be released as giclées on paper during my Museum Open House and Barn Show December 11-13. For more information, please contact the Museum at 1-800-343-8643. "It's starting to look a lot like Christmas!" Congratulations to Moss on the James Chapter of the P. Buckley Moss Society, which celebrated its 20th Anniversary on November 19! The Moss on the James Chapter hales from the Richmond, Va., area. My daughter Patty attended the party.